Lettre à Ceel_Video HD_2’30″_2014; See Giglio Island. “Dreaming of islands whether with joy or in fear, it doesn’t matter is dreaming of pulling away, of being already separate, far from any continent, of being lost and alone or it is dreaming of starting from scratch, recreating, beginning anew. 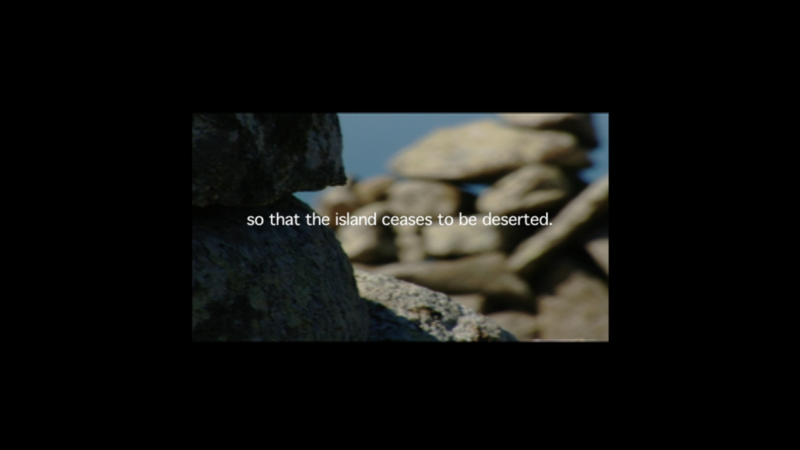 Some islands drifted away from the conti- nent, but the island is also that toward which one drifts; other islands originated in the ocean, but the island is also the origin, radical and absolute (…) Also, that an island is deserted must appear philosophically normal to us. Humans cannot live, nor live in security, unless they assume that the active struggle between earth and water is over, or at least contained. People like to call these two elements mother and father, assigning them gender roles according to the whim of their fancy. They must somehow persuade themselves that a struggle of this kind does not exist, or that it has somehow ended. In one way or another, the very existence of islands is the negation of this point of view, of this effort, this conviction”. G.Deleuze, Desert Islands And OtherTexts 1953-1974.